Andy Stanley is one of my very favorite authors and speakers. I listen to his monthly leadership podcast and read everything he writes. 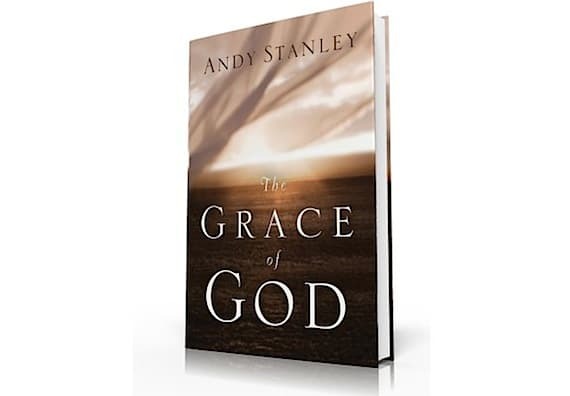 Last week, we released his newest book, The Grace of God. In case you don’t know, Andy Stanley is the founder of North Point Ministries (NPM), one of the fastest growing and most influential Christian organizations in America. Each Sunday, over 20,000 adults attend services at one of NPM’s three campuses in the Atlanta area: North Point Community Church, Browns Bridge Community Church, and Buckhead Church. Andy is also a best-selling author of Visioneering, The Next Generation Leader, and The Principle of the Path. He and his wife, Sandra, live in Alpharetta, Georgia, with their three children. Recently, I had the opportunity to interview Andy about his new book and about what he is learning. Q: So often we hear from you on leadership, vision, and communication. I’m curious. Why did you choose to write on the topic of grace? My publisher, Matt Baugher, pointed out that I preach on this topic often but had never written about it. He asked me to consider a book on grace and immediately I got excited about it. Q: There’s no subtitle to this book. If you were to add a subtitle, what would it be? Q: It is easy to see the grace of God throughout the New Testament, but you say, “a careful reading of the Old Testament reveals grace to be God’s preeminent characteristic from the very beginning.” When do you believe we are first introduced to God’s grace? Creation. Not to get too philosophical, but why is there anything? Why did God bother to create anything? For His glory, certainly. But life itself, the opportunity to live, to love, to be loved is an expression of God’s grace. Q: It is evident that the church today has an uneasy relationship with grace. How can we, the church, do a better job of consistently communicating the message of grace? The church, or I should say, church people, must quit adding the word “but” to the end of our sentences about grace. Grace plus is no longer grace. Grace minus is no longer grace. We are afraid people will abuse grace if presented in its purest form. We need not fear that, we should assume that. Religious people crucified grace personified. Of course grace will be abused. But grace is a powerful dynamic. Grace wins out in the end. It is not our responsibility to qualify it. It is our responsibility to proclaim it and model it. Q: In the opening chapter you say, “When we are on the receiving end, grace is refreshing. When it is required of us, it is often disturbing.” It is true. How do you fight this constant tension? The only reason I have for extending grace to others is that it has been extended to me. All the “one another” passages in the New Testament: Love one another, serve one another, forgive one another… are anchored to the fact that God did all of that for us. I am to extend grace to others as a response to God’s offer of grace to me. Q: I find that people often confuse grace and mercy. How do you clarify the difference between these two ideas? Mercy is not proactive. Mercy is not getting what I deserve. I can decide not to punish my children. But that different from doing something FOR them when I should actually be doing something TO them. Grace is proactive. Grace doesn’t merely withhold retribution. Grace offers something good in addition to withholding what an individual deserves. Mercy says, “I won’t sue you.” Grace says, “I won’t sue you AND I’ll come over next week and serve you. God didn’t merely withhold punishment, He sent His Son to die for us. Q: From your studies and/or experience, what has surprised you most about grace? It is extraordinarily powerful. It is often extraordinarily slow. Fear works quicker. But fear erodes relationships. Grace is like a crock pot. Q: Who are some voices that you are learning from these days? These days, my staff. I’m surrounded by some great thinkers and great communicators. As I told the crowd at Catalyst last week, my opening talk was inspired by two of our staff communicators. I get a lot of credit for ideas and results that are actually a reflection of the efforts and insights of the brilliant people I get to work with every day. I selected 100 people from the comments below to receive a free copy of this book. You can find the list of winners here. Question: Why do you want a copy of this book? If I give you a copy, do you promise to read it?